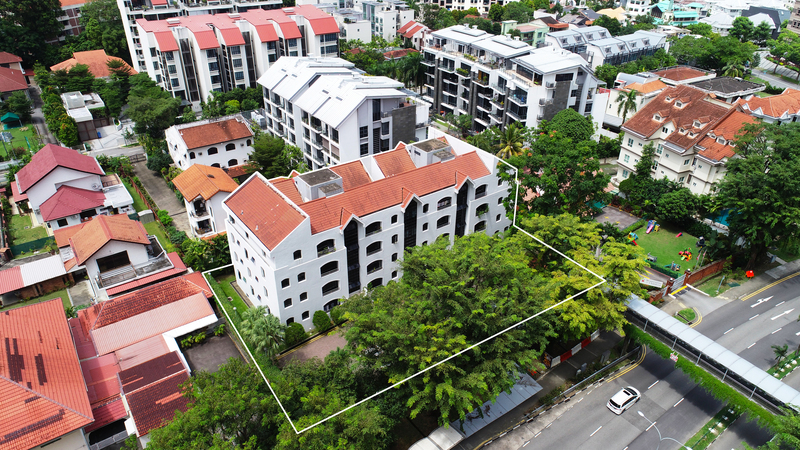 SINGAPORE – Newton Lodge, a 16-unit collective sale site at Newton Road, has been launched for sale by sole marketing agent, JLL. Newton Lodge is conveniently located some 400 meters from the Novena MRT station and the Novena commercial cluster. Major developments around the Novena area have been underway, as the government targets to transform the area into Singapore’s largest healthcare hub by 2030. When completed, Health City Novena, spanning across 17 hectares, is said form an entire ecosystem revolving around health services, medical research and education, integrated with commercial, leisure and public community spaces. The freehold 21,409 sqft site is zoned ‘Residential’ in the 2014 Master Plan with an allowable gross plot ratio (“GPR”) of 1.4. The property may be redeveloped into a low-rise apartment project comprising of up to 27 units with an average size of 100 sqm per unit. Subject to approval from the authorities, Newton Lodge may also be suitable as serviced residences or a custom-built co-living development. If approved for serviced apartments, Newton Lodge could potentially house around 50 to 60 rooms which could be rented for a minimum seven-day stay. “Co-living, a contemporary form of shared housing, is more commonly found in cities such as Hong Kong, China, India and the US, catering to young and mobile occupants. It provides an affordable, high-density living solution with shared and modern spaces that bring together like-minded individuals. Co-living spaces appeal to single, young professionals who are looking for freedom, flexibility and a community,” said Mr Karamjit Singh, Senior Consultant at JLL. “The concept of sharing private and HDB apartments with unrelated tenants is common in Singapore, which is informally a form of co-living. However, professionally-run and organized co-living concepts to the levels of the co-working phenomenon is still in its infancy stage in Singapore, and is expected to grow especially with high stamp duties payable for home purchases by foreigners in Singapore,” added Mr Singh. “Purchasers who wish to develop an entire building for co-living spaces or short-term accommodation should find Newton Lodge’s central location, project size and price quantum attractive. Not only would a boutique-sized project be more manageable, a smaller community of like-minded residents may also result in more meaningful social engagements,” adds Mr Singh. The vendors are expecting a minimum of $44 million for Newton Lodge, which reflects a land rate of $1,468 psf ppr at GPR 1.4. Should the purchaser factor an additional 8 per cent bonus gross floor area for balconies and communal areas, the reserve price translates to a lower rate of approx. $1,359 psf ppr. Development charges are not payable for the redevelopment. The tender for Newton Lodge closes on 26 February 2019 (Tuesday) at 2.30 p.m.
1. For a high-resolution image of the site, please click here.